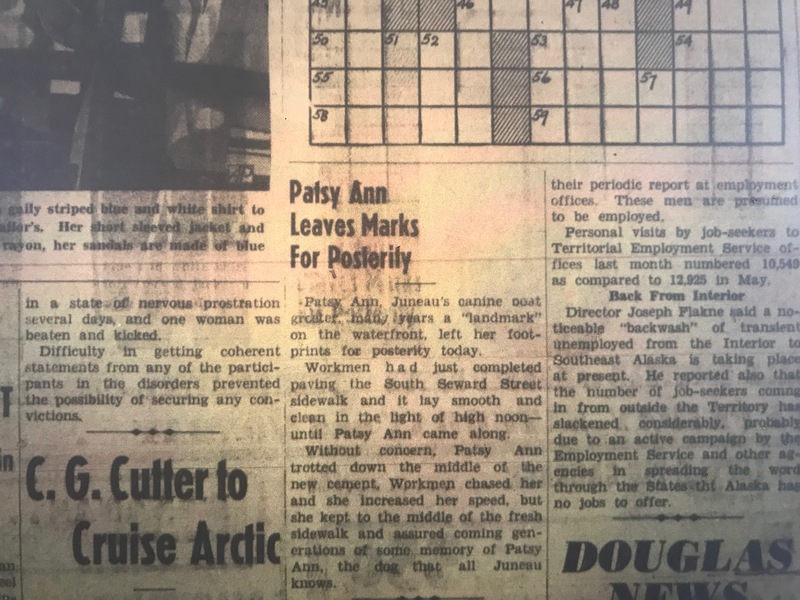 Long ago, Patsy Ann left her mark on historic Juneau, but where? Brooks Pinney, 7, and his 4-year-old brother Bridger love learning about the bull terrier Patsy Ann. They love listening to their mom, Amy Pinney, read them the children’s book “Patsy Ann of Alaska: the true story of a dog” by Tricia Brown. “The kids got super into it. They read it over and over and over, and we took a pedi cab around downtown this summer and learned a little bit more about the sculpture and then it just made it even more fascinating,” Pinney said. Where are those paw prints? Pinney and her kids wanted to know. 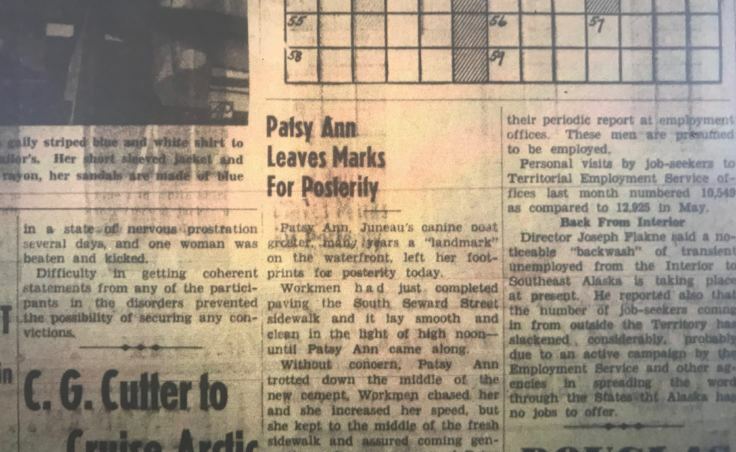 Born in 1929 in Portland, Oregon, Patsy Ann moved to Juneau with her owners as a puppy. Several authors have written that she hated staying indoors, and often wandered around downtown. She would wait on the docks for the ships to come in. So those paw prints would’ve been set about 80 years ago. “Who knows where they would have been downtown, because downtown was so different when Patsy Ann was alive … so maybe nobody even knows where they are. Other than the author, and maybe the author doesn’t even know,” Pinney wondered. “What I remember is when I read about it, I wish I knew when it was because it didn’t say and that was, you know, it sparked my interest as well, so I’m not surprised it’s also inviting somebody else’s curiosity. I just didn’t, I don’t know,” Brown said. Brown thought she read about the paw prints in a short book by Carl Burrows published in 1939. I found it in the Alaska State Library’s historical collections. Burrows’ book is actually a red, 8-page booklet. A sketch of Patsy Ann is on the cover, but there wasn’t a word about paw prints in cement. But Historical Collection library assistant Jacki Swearingen had a lead. 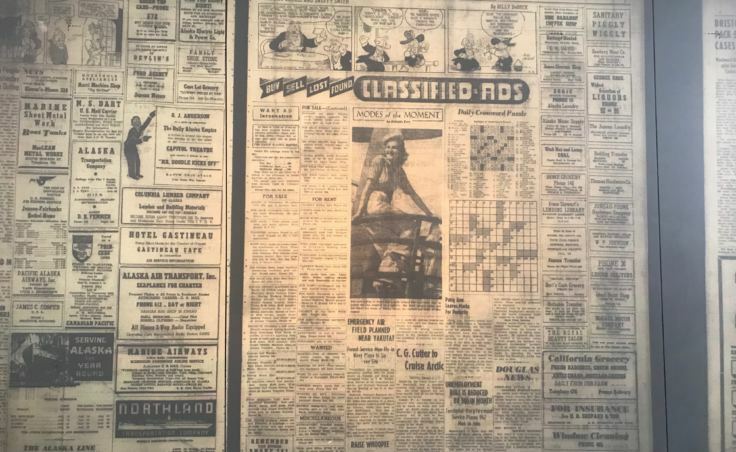 Swearingen came back with list of dates and brief descriptions of newspaper articles. 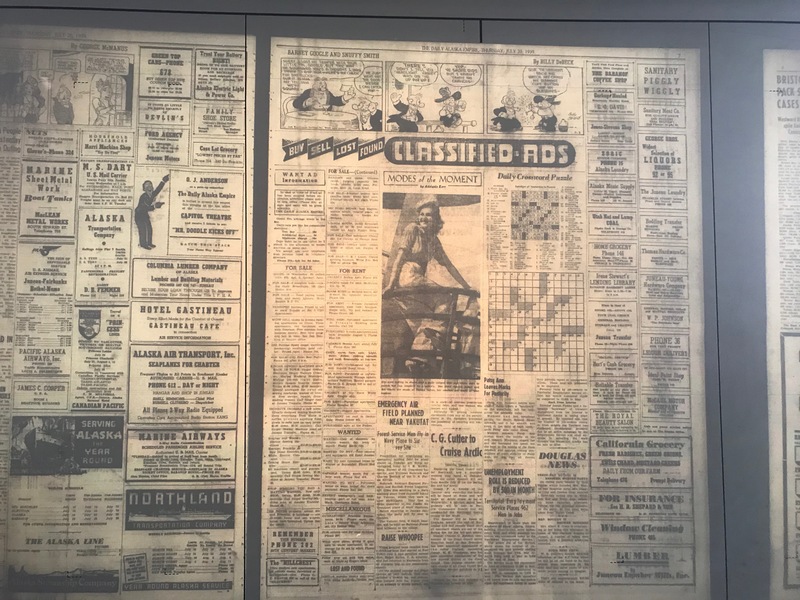 “I think this probably says ‘July 20, 1939’ and maybe that, the seven might mean seventh page of the newspaper,” Swearingen added. Soon I was scrolling through copies of old Daily Alaska Empires on microfilm. 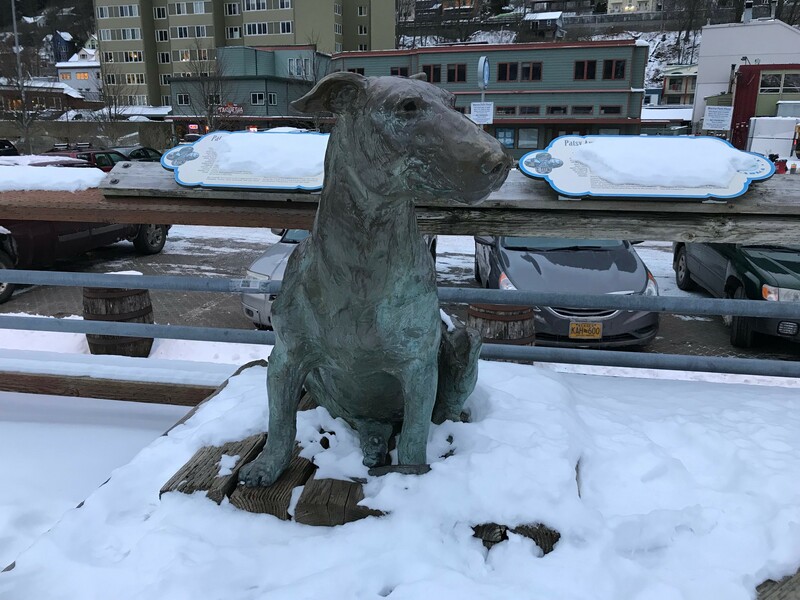 “Patsy Ann, Juneau’s canine boat greeter, many years a ‘landmark’ on the waterfront, left her footprints for posterity today. “Workmen had just completed paving the South Seward Street sidewalk and it lay smooth and clean in the light of high noon — until Patsy Ann came along. So that’s that. Patsy Ann left her paw prints on a South Seward Street sidewalk. Someone from City and Borough of Juneau Public Works told me that the sidewalk had probably been through two to four iterations since then. I met with Amy Pinney and her kids on a snowy, windy day on South Seward, to share with them what I had found. But seven-year-old Brooks still had a question. “Why did they have to rip apart Patsy Ann’s track?” he asked. Patsy Ann passed away in 1942, but you can still see her statue on the downtown Juneau waterfront. Even though her paw prints are gone, her story is still capturing Juneau kids’ imaginations.